The Materials command opens the Materials panel which specifies the color, finish, transparency, texture, and bump for use by the built-in Rhino renderer. Materials can be dragged and dropped onto any Material, Texture, and Environment control. Any number of materials can be stored in the model. Materials can be designed in-place in the material and environment editors by adding textures as child. Opening a floating preview allows visualization of the texture during its development. Colors can be dragged from a color swatch and dropped onto a different color swatch. 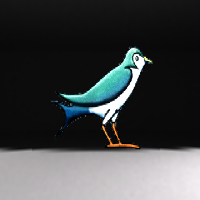 Drag a texture from a texture field and drop it onto a different texture field to move. Hold the Ctrl key to copy. Material Editor displays materials used by objects in linked 3dm files. The materials can be used in the current model, but they are not editable. Double-click a linked block to edit the materials in a new Rhino window. The Materials panel has additional browsing tools. Right-click and drag in the thumbnail to change the view. In the thumbnail browser, click Create New Material. On the menu, select a material type. Imports a material (.rmtl) from the Render Content library folder. Creates a new material. Choose a material type to use as a template. Creates a new custom material. Custom materials have all possible settings available in the editor. Creates a new gem material. Creates a new glass material. Creates a new metal material. Creates a new paint material. Creates a new picture material. Creates a new plaster material. Creates a new plastic material. Opens the content type browser to see more options for creating a new material. Render materials are assigned using the current rendering plug-in application. This option appears only if there is a rendering plug-in loaded. Changes the material properties to match a different object. Add multiple categories or descriptions that can be used to search for materials in the libraries. Type a hyphen in front of the command name: -Properties. Select Material or type m.
At any time, you can change the material to a different type using this control. Changing a material type maintains all of the settings the material types share. For example, changing a gold metal material to a paint material maintains the gold diffuse color. Changing the gold to a gem matches the gem color and becomes Amber. The default material is white and matte, with no reflectivity or transparency. The Color control sets the material's base (also called diffuse) color. 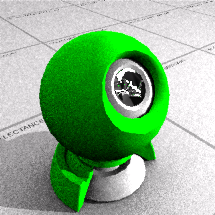 The color used to render surfaces, polysurfaces, or polygon meshes. The color option does not affect the select wireframe display. To change the color of the wireframe display, change the color of the object's layer or set the color in Object Properties. In the edit box, specify the percentage of strength the color. The Gloss finish control adjusts the highlight from matte to glossy and sets the color of the glossy area. Move the slider to the right to increase the glossiness. Select the gloss finish color using the color swatch. Set the highlight color to match the base color for metallic materials. Set the gloss color to white for plastic materials. The Reflectivity setting sets the material's reflectivity amount and sets the reflective color. Move the slider to the right to increase the reflectivity. Select the reflectivity color using the color swatch. 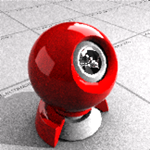 Adjusts the transparency of an object in the rendered image. Move the slider to the right to increase the transparency. Sets the level of transparency based on the index of refraction (IOR) scale. Select the transparency color using the color swatch. 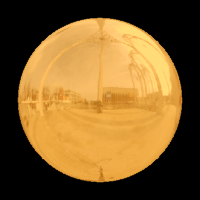 Textures (images or procedural textures) can be used for color, transparency, bump, and environment. Images changed outside of Rhino in Photoshop or a similar program automatically update in the rendered view. Materials in the material library use textures stored on the internet the first time they are used. Select an image file to use. Specifies a texture to use as the material's color. Note: Texture colors override mesh vertex colors. Reducing texture opacity blends texture colors with vertex colors. Sets a texture to use as the material's transparency. Sets a texture to use as the material's bump. 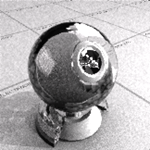 Defines the name of an image file that will be mapped on the surface as a bump map when you render the scene. An image makes a surface appear bumpy in a rendered image but does not modify the shape of the surface. Sets a texture to use as the material's environment. This will be mapped onto the surface as though it were being reflected. The image should be an angular map or light probe projection (spherical) image. Other image projections will produce the reflection effect, but it will be distorted and not produce the realistic environment reflection. Allows the material to render the diffuse color with shadowing and shading by enabling diffuse lighting. Diffuse lighting off (left) and on (right). If this setting is on, the object renders with shadowing and shading. 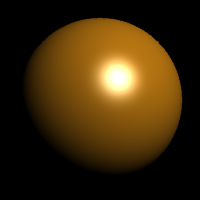 If this setting is off, the object will render the diffuse color all over with no shadowing or shading. Turning this setting off ensures that the color the texture of picture frames remains constant over the surface. 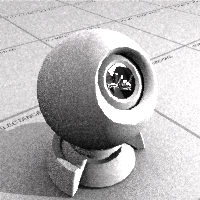 Causes objects to reflect fully at glancing angles and only slightly reflect when the object is seen head on. This effect simulates many transparent or semi-transparent materials, such as glass, plastic, and materials that have a thin transparent glaze, such as laminated paper, polished woods, and paint. Allows images with an alpha channel for transparency to make the object transparent in the areas of the image where the alpha channel is applied. Alpha transparency on (left) and off (right). Makes the surface reflections fuzzy. For surfaces that are perfectly reflective, such as mirrors and chrome, use 100% polish. Lower values model materials like certain plastics and the sanded surface of frosted glass. Changing this setting can increase rendering time. Controls the clarity of the material. Creates translucent materials like tracing paper or hand-made glass. Creates clear materials such as water, float glass, and diamonds. Adds a color to the shaded result. It does not take into account the lighting, so if the emission color is white, the object will always appear white. If the emission color is gray, all parts of the object will appear brighter than they would otherwise. Orange material emission color black (left); emission color blue (right). The preset Gem materials offer a choice of preset gems. Other settings are pre-determined by the gem type. The preset Glass material type allows the Color, Frost, and index of refraction settings to be modified. Other settings are pre-determined. Sets the index of refraction. The preset Metal material allows the Color and Polish to be modified. Other settings are pre-determined by the metal type. Common metal colors are presented in the limited palette. Sets the texture style for the bump from a limited list. Sets the size of the bump pattern. The preset Paint material allows the Color and Glossiness to be modified. Sets the Fresnel reflectivity and Reflection polish. The preset Picture materials place a single image on an object using surface mapping. The Picture material allows the image file, the Self-illumination, Grayscale, and Transparency settings to be modified. Note: Tiling cannot be modified for a picture texture. Sets the image file to be used. Self-illuminated on (left) and off (right). Sets the image to grayscale. Sets the transparency of the image. Uses the alpha channel in the image to set the transparency. 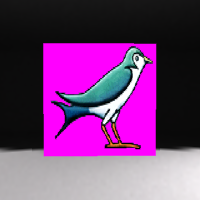 Uses a specific color in the image to set the transparency. Color mask transparency off (left) and on (right). The transparency in the image also makes the object to which the material is applied transparent in the areas covered by the color or alpha channel transparency. The preset Plaster material is the default matte, non-reflective, untextured material. Only the Color can be changed. The preset Plastic material allows the Color, Reflectivity, Polish, Transparency, and Clarity to be changed. Type a hyphen in front of the command name: -Materials. Attach or activate a worksession model. When a render content item name already exists in the current model, but the content settings are different, the conflicted item will be imported with "[imported]" appended to its name.